One of the thousands of commemorative Laffy Taffy 9/11 cobblestones. 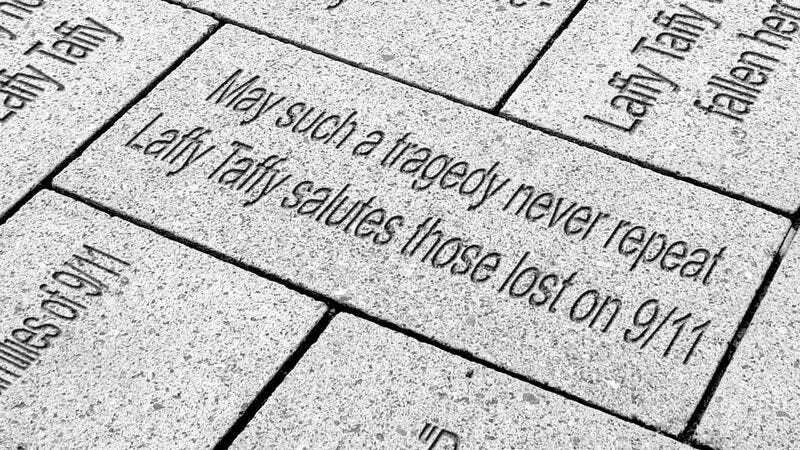 NEW YORK—The makers of Laffy Taffy, a chewy fruit-flavored candy known for the lighthearted jokes printed on each wrapper, announced Tuesday they would pay tribute to the victims of 9/11 by sponsoring every single cobblestone at the World Trade Center memorial. "No one can ever forget the events of that tragic day, and Laffy Taffy is proud to honor the families of our fallen heroes," a company spokesperson said at a press conference held near Ground Zero in Lower Manhattan. "When we chisel the words 'Laffy Taffy' into each eternal stone on this sacred ground, we will show the citizens of our great, enduring nation that despite any calamity, they can always count on Laffy Taffy." Company sources also confirmed that victims of the famine in Somalia had received more than 10,000 pounds of Laffy Taffy.